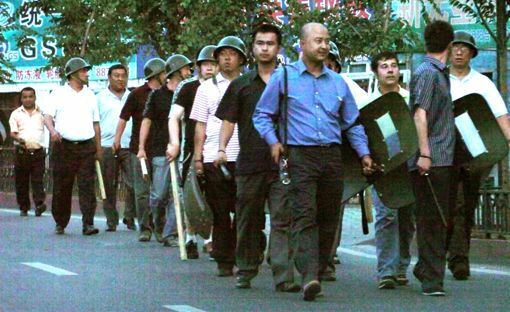 Bazaar — a largely Uighur neighborhood — carrying batons and shields. 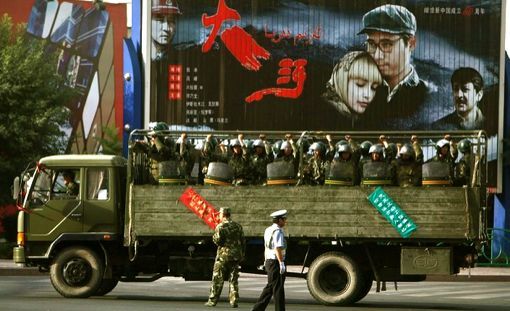 Security forces have clamped down on the city of Urumqi and set up checkpoints to catch any fleeing rioters, state media reported, after tensions between ethnic Muslim Uighur people and China's Han majority erupted into riots. 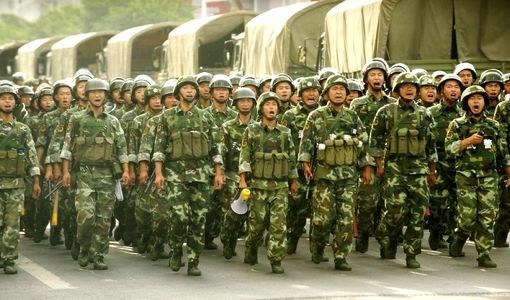 Xinhua News reported several hundreds had been arrested in connection with the riot and police were searching for about 90 other "key suspects." 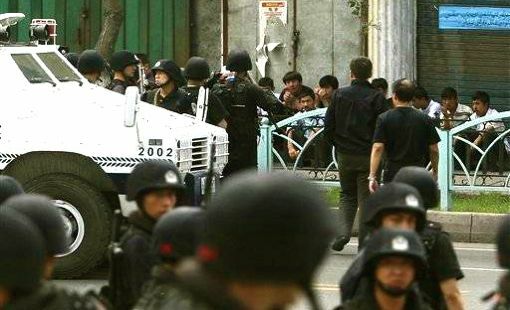 It earlier reported that four people had been killed in violence after protesters from a Muslim ethnic group rioted Sunday in the region's capital Urumqi, resulted huge clash with massive armed police. 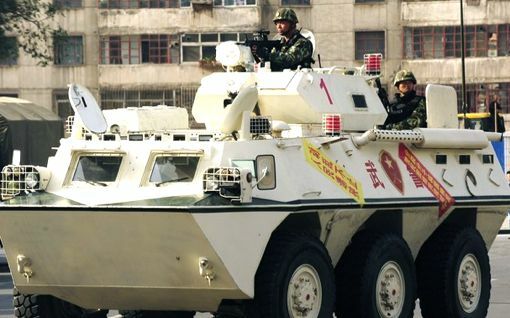 Adam Grode, an American Fulbright scholar studying in Urumqi, described a heavy police and military presence in the city Monday. 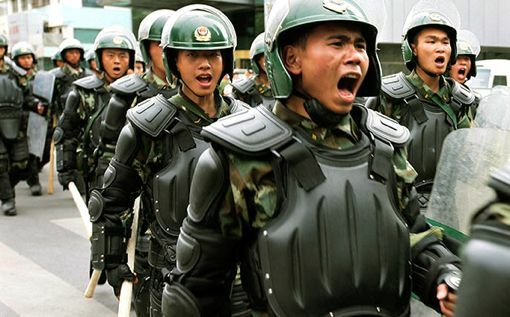 "There are soldiers everywhere, police are at all the corners. Traffic has completely stopped but people are walking on the sidewalks," Grode said. He said authorities took him to the police station Monday morning after seeing him taking photographs from his apartment window. They deleted his photos, confiscated his passport and released him. They gave no reason for taking his passport but said it would be returned Tuesday. 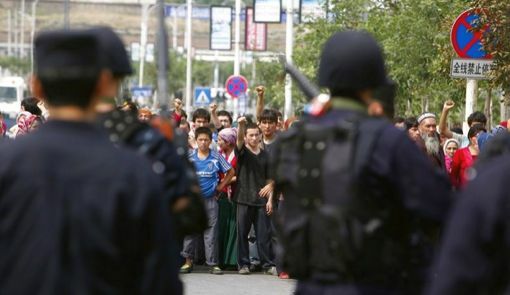 Another student Seytoff said he had heard from two sources that at least two dozen people had been killed by gunfire or crushed by armored police vehicles just outside Xinjiang University. 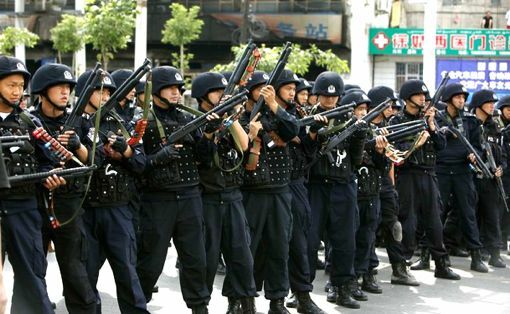 Xinjang's Police chief said checkpoints had been set up in the city and in neighboring Changji and Turpan prefectures to prevent the rioters from fleeing. 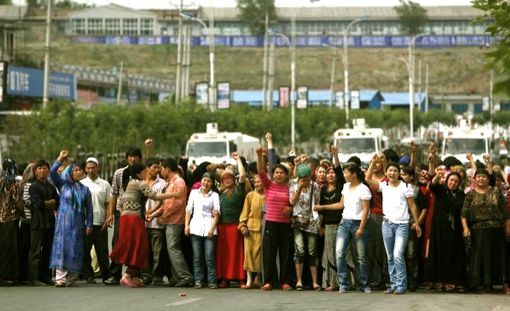 Meanwhile, witnesses reported a new, smaller protest in Kashgar, a second city in Xinjiang, on Monday afternoon. 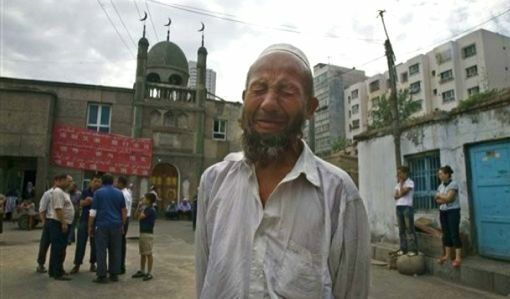 A Uighur man there said he was among more than 300 protesters who demonstrated outside the Id Kah Mosque, surrounded by police trying to calm them down. 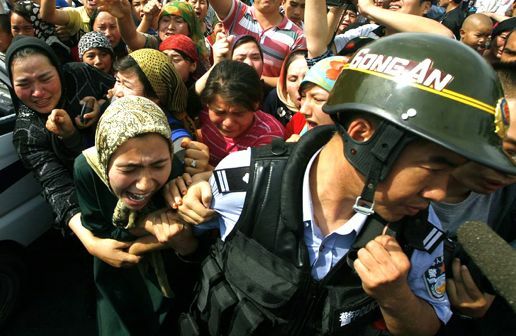 Calls to Kashgar's public security bureau rang, then were disconnected. 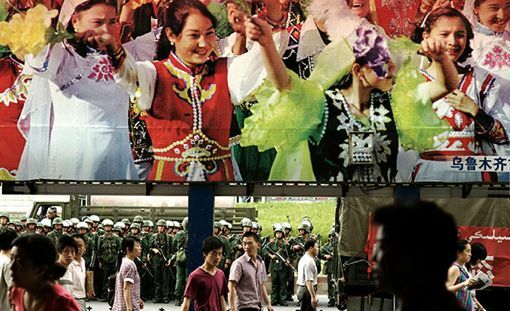 The unrest is another troubling sign for Beijing at how rapid economic development has failed to stem — and even has exacerbated — resentment among ethnic minorities, who say they are being marginalized in their homelands as Chinese migrants pour in. 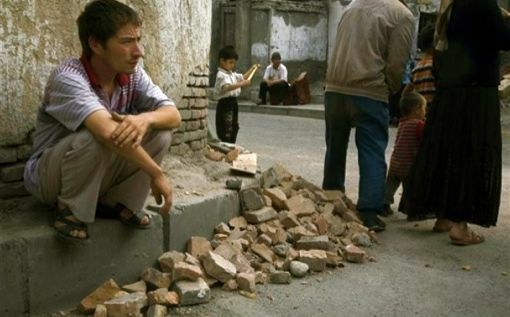 In 1990, about 200 Uighurs shouting for holy war protested through Baren, a town near the Afghan border, resulting in violence that left at least two dozen people dead. 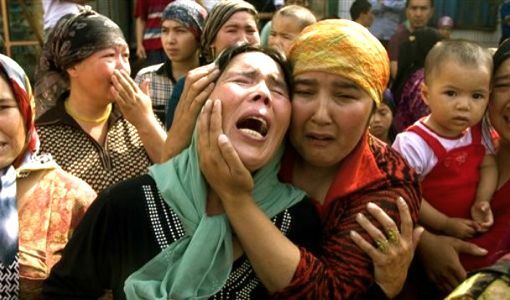 In 1997, amid a wave of bombings and assassinations, a protest by several hundred Uighurs in the city of Yining against religious restrictions turned into an anti-Chinese uprising that left at least 10 dead. 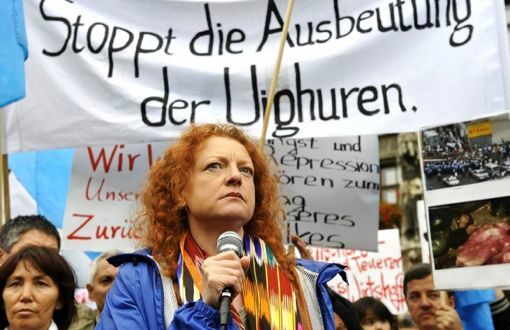 In both cases pro-independence groups said the death tolls were several times higher, and the government never conducted a public investigation into the events. 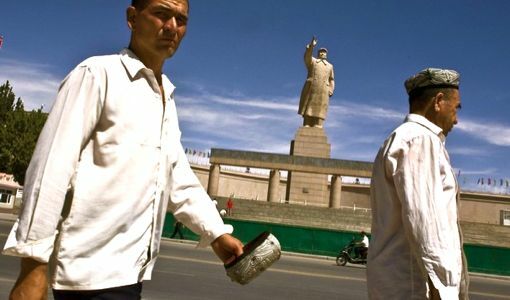 Tensions between Uighurs and the majority Han Chinese are never far from the surface in Xinjiang, China's vast Central Asian buffer province, where militant Uighurs have waged a sporadic, violent separatist campaign. 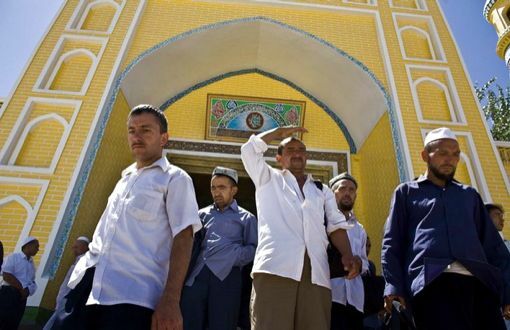 Tensions between Uighurs and the majority Han Chinese are never far from the surface in Xinjiang, China's vast Central Asian buffer province, where militant Uighurs have waged a sporadic, violent separatist campaign. 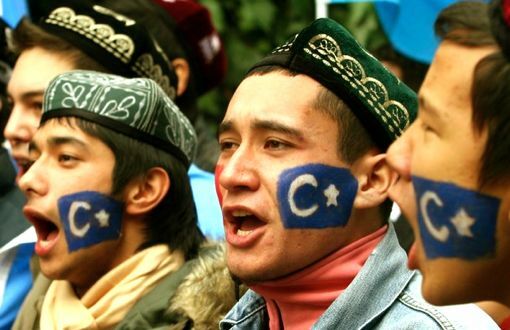 Many Uighurs yearn for independence for Xinjiang. 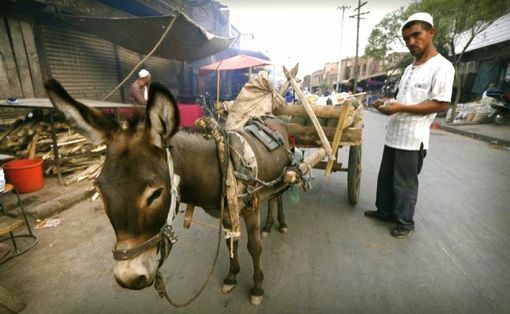 Xinjiang is a sprawling region, rich in minerals and oil that borders eight Central Asian nations. 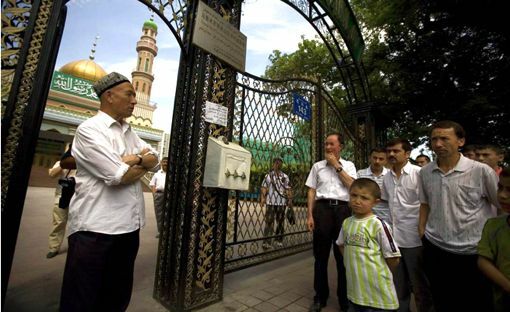 Uighurs make up the largest ethnic group in Xinjiang, but not in the capital of Urumqi, which has attracted large numbers of Han Chinese migrants. 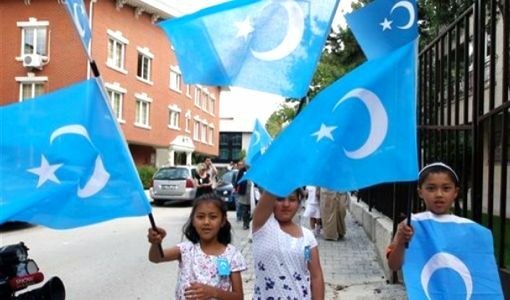 The city of 2.3 million is now about overwhelmingly Chinese — a source of frustration for native Uighurs who say they are being squeezed out. 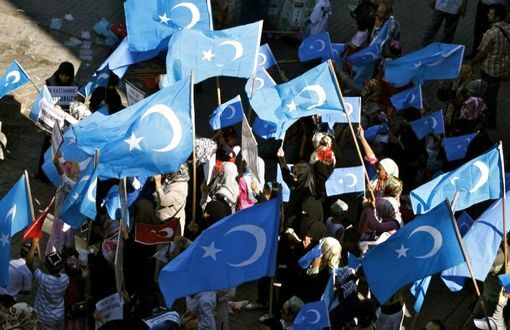 Critics say the millions of Han Chinese settled here in recent years are gradually squeezing Turkish Uighurs out of their homeland. 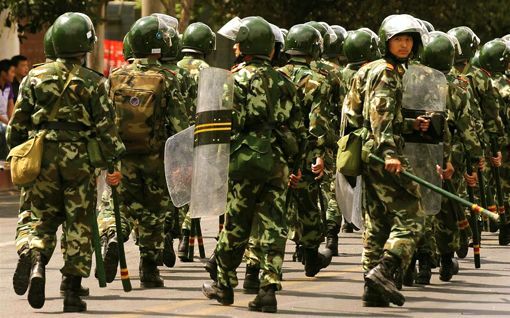 The clashes in Urumqi echoed last year's unrest in Tibet, when a peaceful demonstration by monks in the capital of Lhasa erupted into riots that spread to surrounding areas, leaving at least 22 dead. 13. 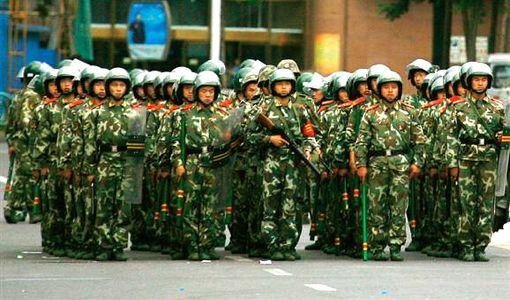 Backlash of China's "Autonomous Colonialism"
Beijing accused the Dalai Lama, exiled Tibetan spiritual leader, of orchestrating the violence — a charge he denied. 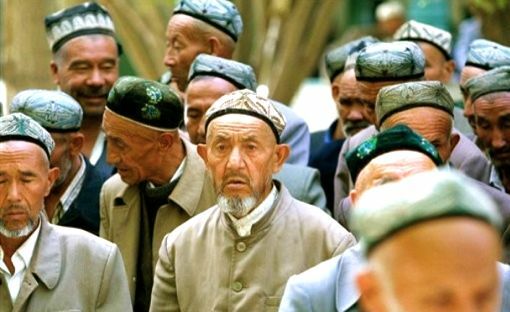 Also many Chinese believe the Uighurs are backward and ungrateful for the economic development the Chinese have brought to the poor region. 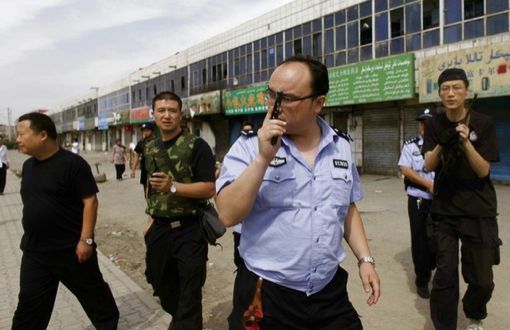 URUMQI, China — Violence in the capital of China's volatile Xinjiang region killed 150 people and injured 828, an official said Monday, following rioting by members of a Muslim ethnic group and a police crackdown on their demonstrations. 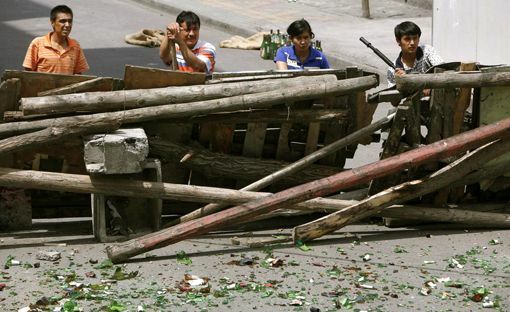 The violence in Urumqi apparently happened after a peaceful protest Sunday of about 1,000 to 3,000 people spun out of control, with rioters overturning barricades, attacking vehicles and houses, and clashing with police. 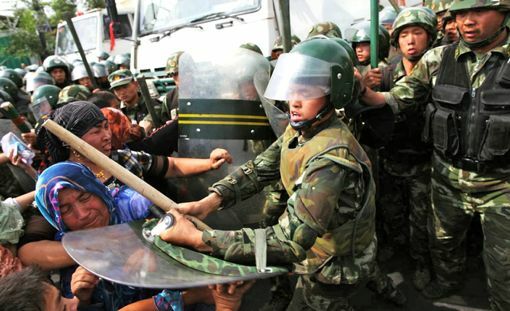 Uighur exile groups said the violence started only after police began violently cracking down on the peaceful protest. 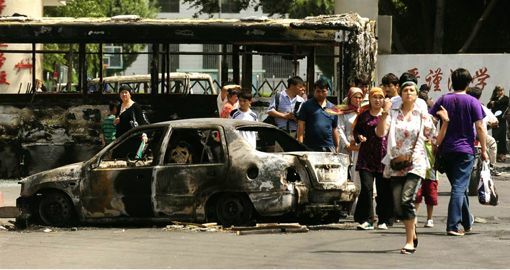 Wu Nong, director of the news office of the Xinjiang provincial government, said more than 260 vehicles were attacked or set on fire and 203 houses were damaged. 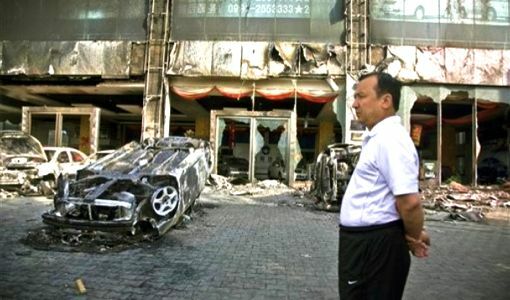 He said 140 people were killed and 828 injured in the violence. 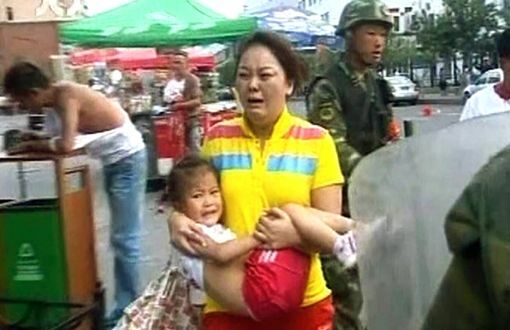 The official Xinhua News Agency also said 140 people died and that the death toll "was still climbing." 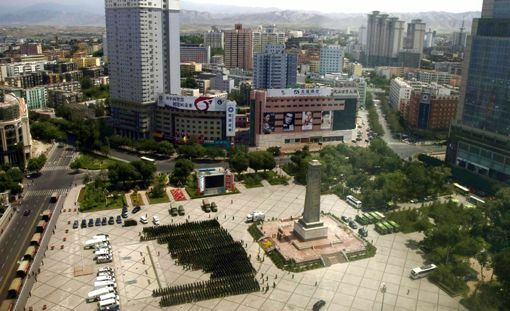 A witness who left Urumqi on Monday morning confirmed to NBC News a large presence of Chinese troops in parts of the city. 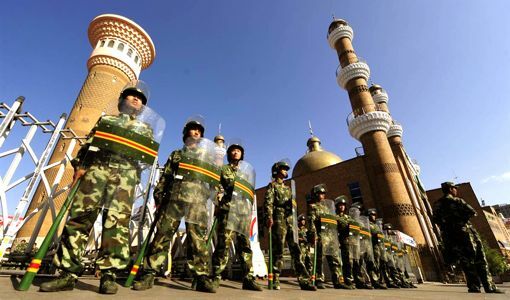 China's state Council Information Office also reiterated that foreign journalists were welcome to travel to Xinjiang and report what they saw, suggesting the authorities believe they have the situation under control, NBC News' Adrienne Mong reported from Beijing on Monday. Rioters on Sunday overturned barricades, attacking vehicles and houses, and clashed violently with police, according to media and witness accounts. 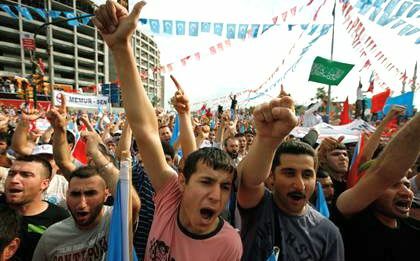 State television aired footage showing protesters attacking and kicking people on the ground. 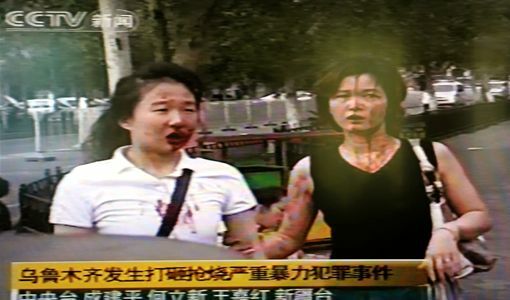 Other people, who appeared to be Han Chinese, sat dazed with blood pouring down their faces. There was little immediate explanation for how so many people died. 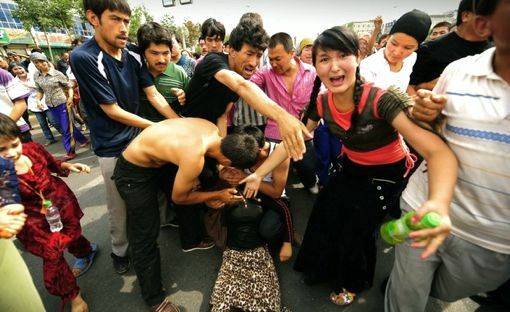 The protest started Sunday with demonstrators demanding a probe into a fight between Uighurs and Han Chinese workers at a southern China factory last month. 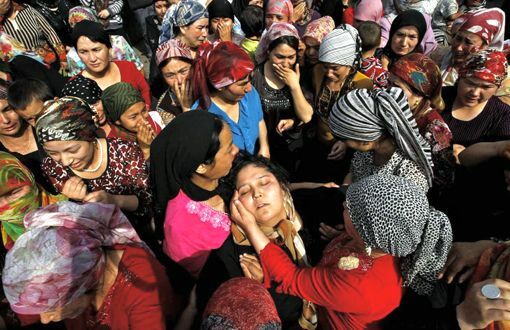 The demonstrators had been demanding justice for two Uighurs killed last month during a fight with Han Chinese co-workers at a factory in southern China. 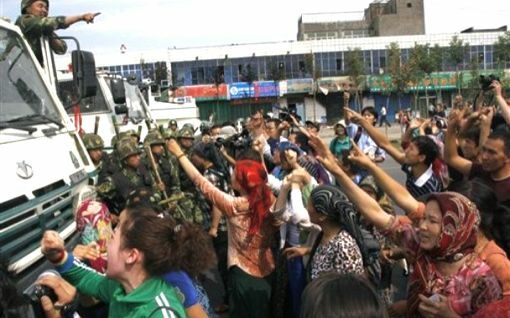 Accounts differed over what happened next in Urumqi, but the violence seemed to have started when a crowd of protesters — who started out peaceful — refused to disperse. 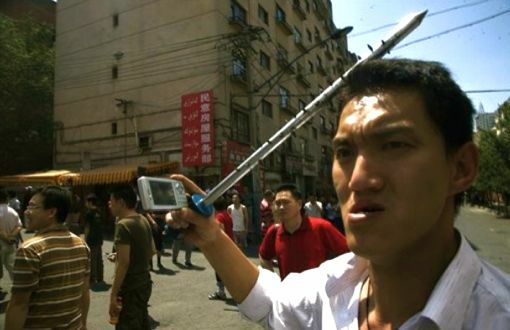 Adam Grode, an American Fulbright scholar studying in Urumqi, said he heard explosions and also saw a few people being carried off on stretchers and a Han Chinese man with blood on his shirt entering a hospital. Grobe said he saw police pushing people back with tear gas, fire hoses and batons, and protesters knocking over police barriers and smashing bus windows. 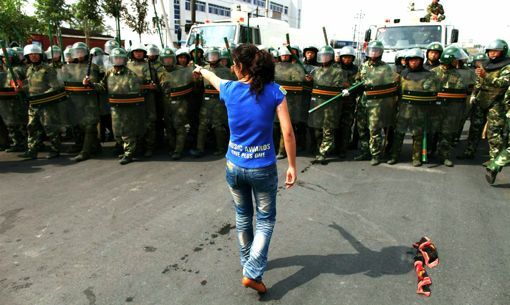 "Every time the police showed some force, the people would jump the barriers and get back on the street. It was like a cat-and-mouse sort of game," said Grode, 26. 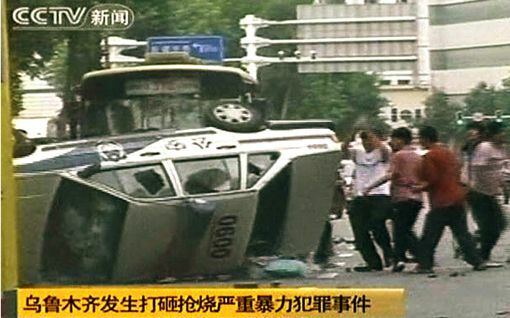 The government's Xinhua News Agency earlier quoted that at least three ethnic Han Chinese were killed in the violence, in which the crowd attacked passers-by, torched vehicles and interrupted traffic on some roads. 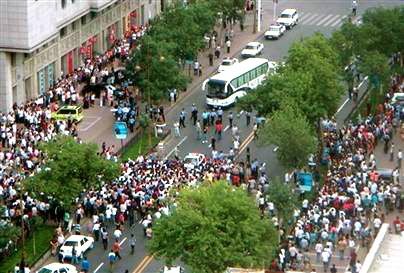 It later said an unknown number of people were killed, including the policeman. 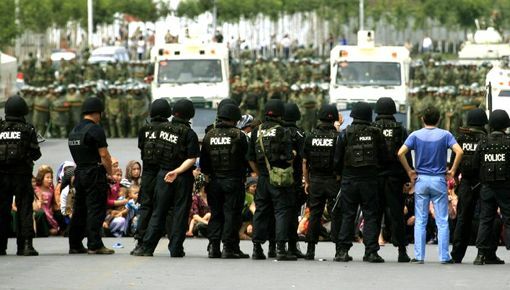 The official Xinhua News Agency reported hundreds of people were arrested. 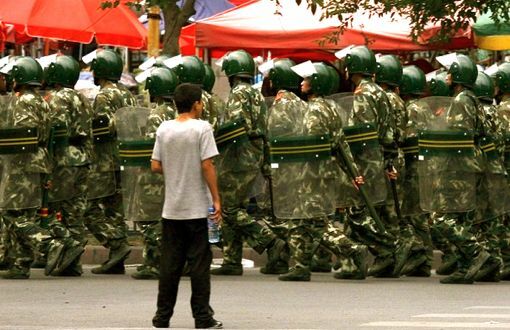 Mobile phone service provided by at least one company was cut Monday to stop people from organizing further action in Xinjiang. 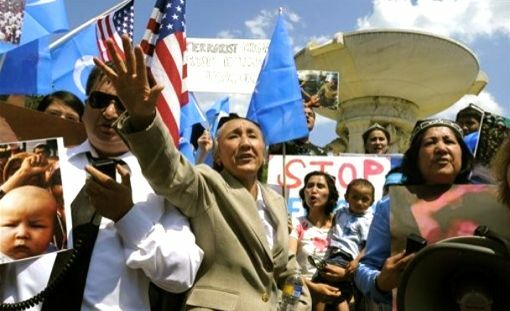 "We are extremely saddened by the heavy-handed use of force by the Chinese security forces against the peaceful demonstrators," said Alim Seytoff, vice president of the Washington-based Uyghur American Association. 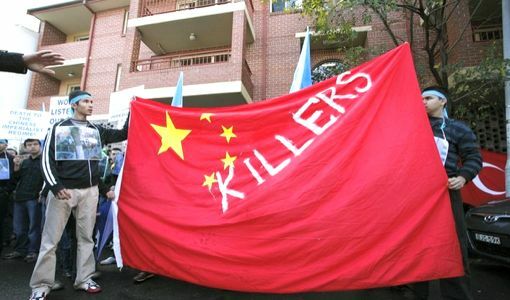 "We ask the international community to condemn China's killing of innocent Uighur. 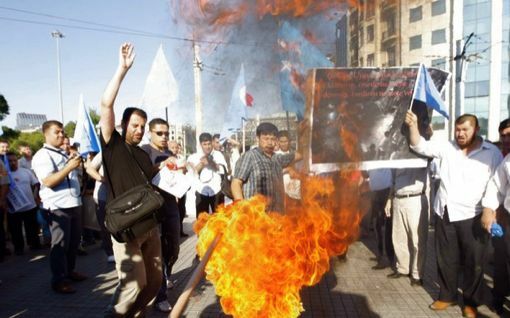 This is a very dark day in the history of the Uighur people," he said. 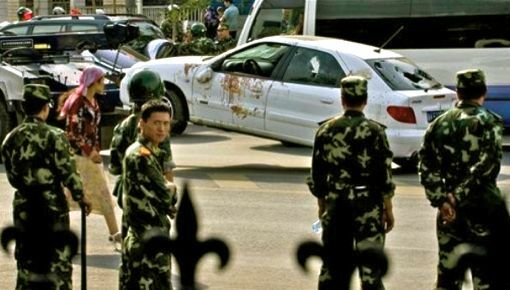 Seytoff said he had heard from two sources that at least two dozen people had been killed by gunfire or crushed by armored police vehicles just outside Xinjiang University. 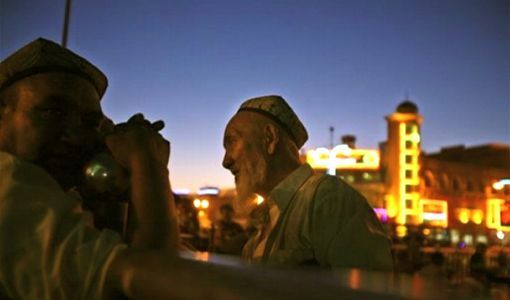 Kakharman Khozamberdi — leader of a Uighur political movement in Kazakhstan, where the Uighur minority has its largest presence outside China — said machine gun fire was heard all night long. One witness told Khozamberdi 10 bodies were seen near a bazaar, including those of women and children. 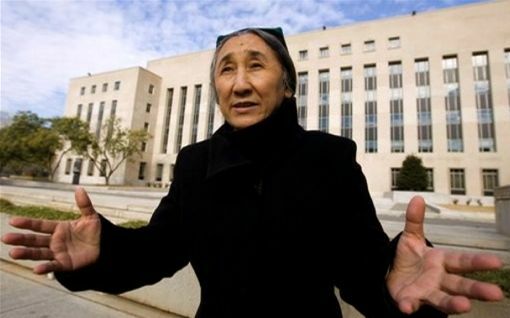 Chinese officials singled out the leader of the association — Rebiya Kadeer, a former prominent Xinjiang businesswoman now living in Washington — for inciting the violence. 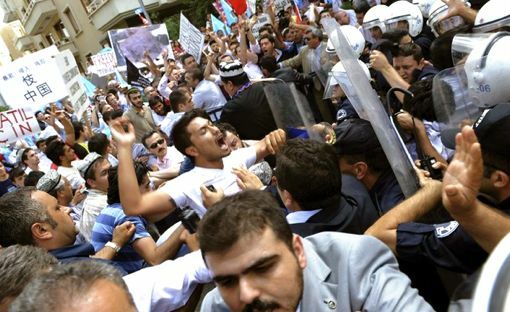 Exile groups said the violence started only after police began violently cracking down on a peaceful protest. About 1,000 to 3,000 people had gathered Sunday in the regional capital for the protest that apparently spun out of control. Accounts differed over what happened, but the violence seemed to have started when the crowd of protesters refused to disperse. 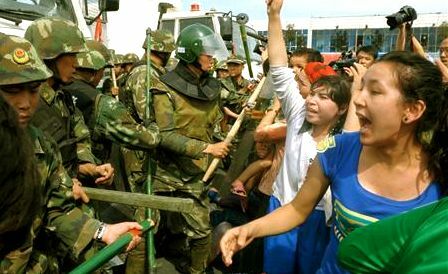 Xinjiang's top Communist Party official, Wang Lequan, called the incident "a profound lesson learned in blood." "We must tear away Rebiya's mask and let the world see her true nature," Wang said. 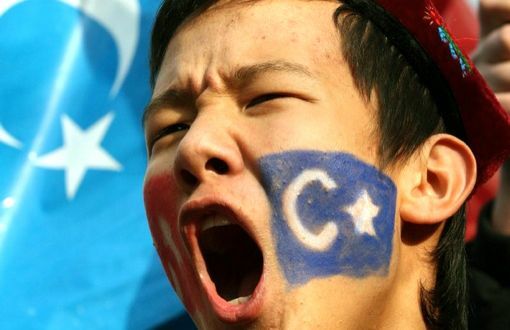 "Rebiya had phone conversations with people in China on July 5 in order to incite, and Web sites such as Uighurbiz.cn and Diyarim.com were used to orchestrate the incitement and spread propaganda," Xinjiang Governor Nur Bekri said on television early Monday. 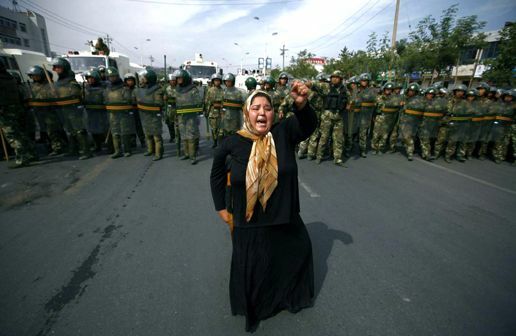 Uighur exiles condemned the crackdown. 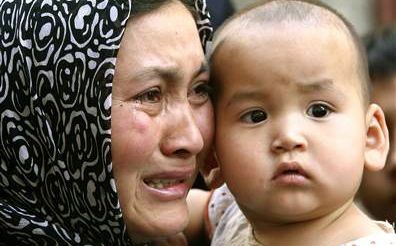 "We ask the international community to condemn China's killing of innocent Uighurs. 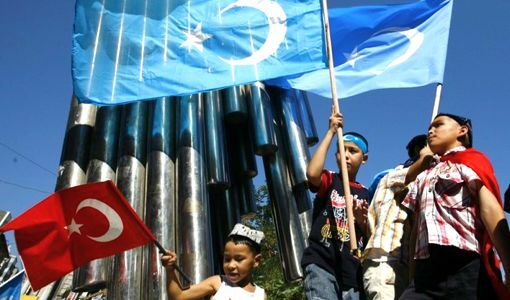 This is a very dark day in the history of the Uighur people," said Alim Seytoff, vice president of the Washington, D.C.-based Uyghur American Association. 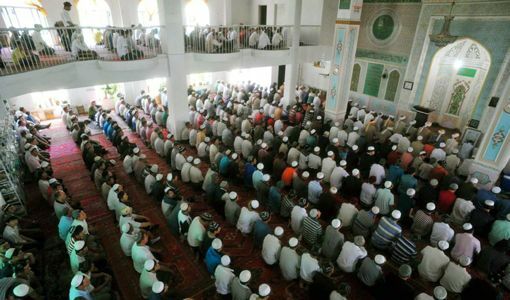 Seytoff dimissed the accusations against Kadeer. 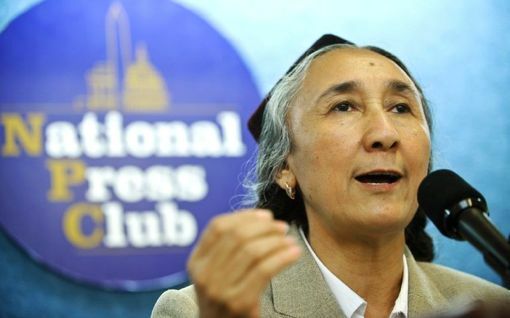 "It's common practice for the Chinese government to accuse Ms. Kadeer for any unrest" in Xinjiang, he said.